What will you learn on your next Coastal Alabama day trip? From the history of Mardi Gras to the natural wonder of the Delta, our lessons are awesome! 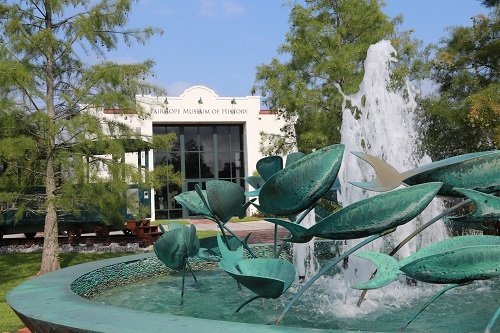 Step back in time at the Fairhope Museum of History. If you love Mardi Gras, then Mobile is your town. As a matter of fact Mobile is THE birthplace of Mardi Gras, and the Mobile Carnival Museum is a must-see. Visitors can immerse themselves in the rich history and traditions of carnival, and view videos of parades and balls. The Museum also showcases the intricate designs and artistry of majestic crowns, scepters and robes of the Mardi Gras monarchs. The art of costume design and a gallery of historical Mardi Gras photographs dating back to 1886 make this one of the most unique museums in the country. The Mobile Museum of Art (MMofA) includes a permanent collection of close to 10,000 works of fine and decorative arts from America, Asia, and Europe. This collection spans periods from classical antiquity to the present day. Surrounded by walking paths, a pond and a park, it is a beautiful place to spend the day and is the spot for many lovely events year-round. With 90 interactive exhibits, simulators, displays, and theaters, the Gulf Question National Maritime Museum is a one-of-a-kind experience. The maritime exhibits are housed on multiple decks of a life-sized replica of a container ship, so come ready to walk and browse and take your time. There are many places to sit and enjoy the view, both inside the museum and outside overlooking the beautiful Mobile River and the busy Port of Mobile. The Gulf Coast Exploreum Science Center is another must-see in Mobile. Packed with permanent and popular traveling exhibits, people of all ages enjoy a fun learning environment. Exhibits and events are all focused on provoking innovative and critical thinking that leads to the discovery of what could be and an appreciation for math, science, technology and nature. Where the Mobile, Spanish, Tensaw, Apalachee and Blakeley rivers flow into Mobile Bay stands an incredible facility for outdoor recreation, conservation and land stewardship in Alabama: the 5 Rivers Delta Resource Center. The Center is the ultimate place to begin an adventure into more than 250,000 acres of scenic waterways, woods and wetlands or visit the facility’s free exhibits that educate guests on the amazing number of animals and variety of ecosystems of the Delta. Historic Blakeley State Park offers guided group tours of their Civil War battlefield and the enchanting site of the ghost town of Blakeley. The Claude Peteet Mariculture Center, located in Gulf Shores, conducts marine research on fish, shrimp and oysters. They offer tours every Wednesday for guests to see the inner-workings of the fish hatchery. The center also houses aquarium tanks that showcase various types of Gulf marine life. Call the main office to schedule at tour at 251-968-7576. Step back in time and explore the grounds of historic Fort Morgan. This is a great way for both children and adults to learn about the Battle of Mobile Bay and that history of the U.S. Navy. The fort and museum are open daily with times varying by season. Capture the magic of model trains at Foley’s Train Depot Museum, Railroad Museum and Model Train Exhibit. The Depot Museum is housed in the Louisville and Nashville railroad station built in 1909. Catch a glimpse into the history and culture of Foley and Baldwin County. The museum contains reminders of the days when Foley was a thriving agricultural center and the railroad played a major role in its prosperity. Not only will you find a delightful display of model trains crisscrossing an enormous, elaborate track. There is a Main Street USA complete with a fire station, church, bus station, city park, homes and stores—all with an “N” gauge train that carries children around the park. You will find a farm, a saw mill, and a coal company at one end of the layout and an oil mill at the other. There is a line shack with working pulleys on latches and other machinery as well. Step back in time at the Holmes Medical Museum, actually housed in Baldwin County’s first hospital, which served the South Baldwin area from 1936 – 1958. Take the self-guided tour and view the Sibley Holmes Memorial Hospital as it would have been 75 years ago. The museum includes extensive displays of medical equipment and patient rooms.